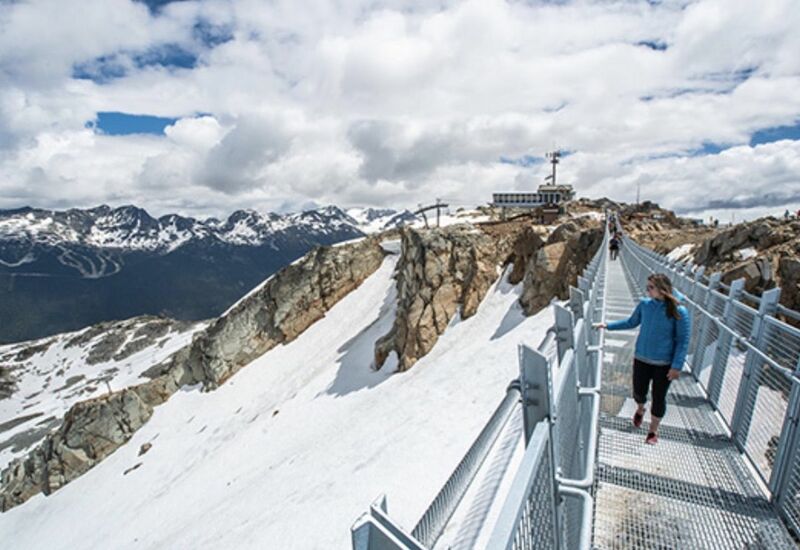 If hiking or skiing in the Whistler Blackcomb area was starting to feel a little mundane, this new suspension bridge is now open to give you that adrenaline rush you’ve been craving. Earlier this month, the Peak Suspension Bridge opened to the public in British Columbia. The bridge is 427 feet long, and it’s situated at the peak of Whistler Mountain at an elevation of about 7,200 feet, making it one of the highest in the world. Visitors can also enjoy the new West Ridge View Point, a viewing platform on the Peak Suspension Bridge that looks over the western edge of a valley-facing cliff. The platform offers 360° views from the peak, extending 41 feet out from the West Ridge. The bridge and viewpoint are accessible by the Peak Express chairlift, which is just a short walk from the Roundhouse Lodge. Or, if you’re feeling adventurous, you can take one of several hiking trails that lead to the mountaintop. Returning visitors to the mountain will also find other new features, such as the new gondola and lift upgrades, an expansion of the Whistler Mountain Bike Park, and renovations to the Roundhouse Lodge. There are also plans to construct a 163,000-square-foot indoor water park and wave pool at the base of the mountain, a night skiing area, a tree-top ropes course, and more downhill mountain biking trails. What is the future of yoga?